Implementing our rich domain expertise, we bring forth an illustrative Paper Bag Making Machine With Flexographic Printing Machine, which is designed to manufacture flat and satchel paper bags from , grease-proof kraft paper, white paper and poster.These bags are further used for packing confectionery, food stuff, ready-made garments, , tea powder, groceries and dry cleaner. 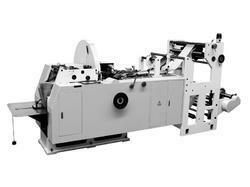 Manufactured using latest technology, these machines are made available at very viable rates. 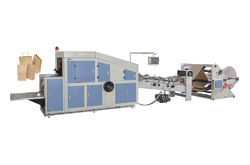 Leveraging on the support of our state-of-the-art-infrastructure, we are able to offer our patrons a wide array of Paper Bag Making Machine with Four Colour Flexo Printing M/C With Four Colour Printing Machine. These machines are used for making flat and satchel paper bags that are used for packing confectionery, food stuff, ready-made garments, , tea powder, groceries and dry cleaner. The above named bags are made from Kraft paper, grease proof, white paper and poster. 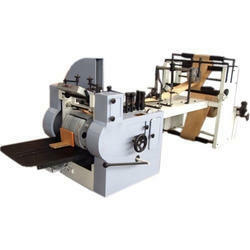 Looking for Paper Bags Making Machine ?